The two articles on the white matter tracts of the temporal stem by Kier et al—“Anatomic Dissection Tractography: A New Method for Precise MR Localization of White Matter Tracts” and “MR Imaging of the Temporal Stem: Anatomic Dissection Tractography of the Uncinate Fasciculus, Inferior Occipitofrontal Fasciculus, and Meyer’s Loop of the Optic Radiation”—in this issue of the AJNR are impressive and important anatomic efforts that hold at least two major implications for neuroradiologists. The first concerns the significant clinical ramifications of merely having access to the anatomy of the white matter association fibers. The second is the scientific advantage of being able to correlate that anatomic information with developing imaging techniques that can demonstrate and evaluate those white matter structures that had previously been opaque to routine imaging. The access to this anatomic information broadens our diagnostic armamentarium by expanding the breadth and depth of our anatomic knowledge. It is easy and perhaps commonplace to limit our diagnostic focus as radiologists to only those structures that are readily demonstrable by routine imaging techniques. White matter tracts such as the internal capsule, cortical spinal tracts, cortical pontine tracts, medial lemniscus, columns of the fornix, mammillothalamic tracts, and medial longitudinal fasiculus are frequently visualized and can be evaluated for pathologic involvement as part of the everyday interpretation of MR images of the brain. It is probably much less likely for a radiologist to comment on the status of the uncinate and inferior occipitofrontal fasciculi. This is not a deliberate attempt to understate the importance of these temporal stem tracts, but rather a practical acknowledgment by limiting comments and familiarity to those tracts that can be visualized rather than speculate about effectively “invisible” anatomy. Kier et al have demonstrated that those “invisible” white matter tracts can indeed be evaluated because of their location relative to structures that are easily imaged, such as the basal ganglia, external capsule, and insular cortex. The immediate benefits of this knowledge directly affect surgical planning (location and proximity of the tumor to the white matter tracts), understanding of tumor spread, and anticipation of clinical deficits related to injury to those tracts (ie, visual field defect when a portion of Meyer’s loop is affected) as mentioned by the authors. A less obvious but more profound benefit would be the broadening and advancing of our understanding of cerebral activity from the centuries-old rudimentary concept of specific functions based in specific areas of the brain to a substantially differently paradigm that instead considers the organization of specific patterns of information distribution and processing among networks (ie, different areas of the brain) to form the basic foundation of mental functions. Therefore, the articles on white matter tracts of the temporal stem should not elicit an indifferent response to seemingly obtuse anatomy that lacks immediate relevance, but should instead generate excitement for the initial opening of doors with techniques to explore the remainder of the association fibers that link the association cortices, which are ultimately responsible for the higher mental functions that define who we are individually and collectively. Our knowledge about the functional influences of these pathways continue to evolve rapidly, but they are known to at least help form many nuances of our neurologic capabilities as demonstrated by the deficits that patients suffer from as a result of lesions involving these structures. The significant role of these patterns of information processing is also implicit in the information generated by the relatively newer MR imaging investigative techniques that evaluate functional connectivity by observing baseline cerebral oscillations in a variety of psychiatric and neurologic disorders. It is plausible for the neuroradiologist, in the very near future, to evaluate functional disorders such as akinetopsia (impaired motion perception), visual agnosia (disorder in recognition), and topographagnosia (impaired recognition of places) by examining the morphology of the inferior occipitofrontal fasciculus (a topic of the articles) and alexia (disorder in recognition of letter), prosopagnosia (impaired face recognition), and bilateral tacto-verbal dysfunction (misnaming of the tactilely presented objects) by scrutinizing the appearance of the inferior longitudinal fasciculus (not a topic of the articles). We will also be required to acquaint ourselves with some of the less-familiar anatomic terminology associated with these fiber tracts, including anatomic details such as the dorsal (posterior parietal lobe) and ventral (temporal lobe) processing “streams” when discussing disorders involving the processing of visual data. In every way, these anatomic data will enhance the role of neuroradiologists as neuroscientists while reinforcing our strategic position to apply the data to the everyday clinical interpretation of MR images of the brain. This additional leverage to our diagnostic acumen will also generate new opportunities to provide clinically significant services to many patients with specific neurologic dysfunctions that might have previously been considered beyond the capabilities of routine imaging techniques. The other association fibers of the white matter (including the superior occipitofrontal, superior longitudinal, inferior longitudinal, and subcallosal fasciculi) await anatomic delineation and detailing with MR correlation. The ability to correlate accurate anatomic data with emerging imaging techniques is important not only to validate the technique, but, more important, also to ensure clinical accuracy. Our field is an intriguing marriage of the empirical reality of medicine with imaging techniques spawned from the bench sciences that derive data from the controlled environment of the abstract. It is easy to become reliant on highly sophisticated new technologies that demonstrate immediately self-evident clinical utility even though it is packaged among unproved, but seemingly promising, potential. These technologies and their applications, furthermore, constantly bombard our consciousness from the continuous marketing campaigns of industry and educational enterprises. After all, how can one question the validity of products that are derived from the logic of science based upon first principles? Without empirical anatomic verification, however, the new imaging techniques would be exposed as merely convoluted exercises in specious reasoning, at best, or clever shell games of corporate America, at worst. Either way, neuroradiologists, as physicians, require anatomic verification and correlation because of our higher ethical commitment to the reality of patients and their tragic disorders. The emerging commercial availability of diffusion tensor imaging (DTI), for instance, requires the anatomic correlation provided by the techniques described by Kier et al. The ability to produce images of the white matter tracts of the brain represents a considerable new advantage to our field in particular and the neurosciences in general. It then becomes vital to ensure the accuracy of that information with substantial anatomic correlation. It is just as vital to also use that anatomic information to determine the limits and caveats of DTI, which is based on the principle of eigenvectors rather than the actual white matter tracts. The preliminary data by Kier et al so far demonstrate a good correlative beginning that may be extrapolated to DTI (Fig 1). Kier et al should be congratulated for their painstaking anatomic efforts. The casual observer may be easily seduced by startling new technologies and tend to dismissively view basic anatomic investigations as a bit of an anachronism, but the valuable correlative anatomic data from detailed anatomic study continue to be surprisingly potent and prove themselves to be the cornerstone of our field, both in the past and for the future. 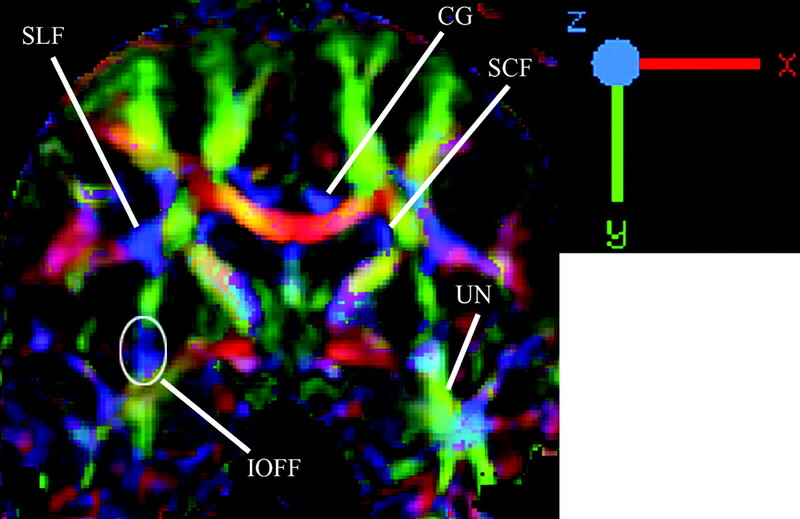 Coronal color-coded fractional anisotropy demonstrating association (labeled), commissural, and projection tracts. The uncinate fasciculus (UN, green) is seen connecting temporal and frontal lobes and the inferior occipitofrontal fasciculus (IOFF, blue) is seen coursing through the inferior aspect of the external capsule superior to the position of the uncinate fasciculus. The different colors indicate the direction of the fibers (or eigenvectors). CG, cingulum; SCF, subcallosal fasciculus; SLF, superior longitudinal fasciculus.